One of the best parts of RVing is that you can follow the good weather. You can hide out in the south during the winter and cool off in the north in the summer. Plus, you can enjoy spring and fall for weeks as you move in between. 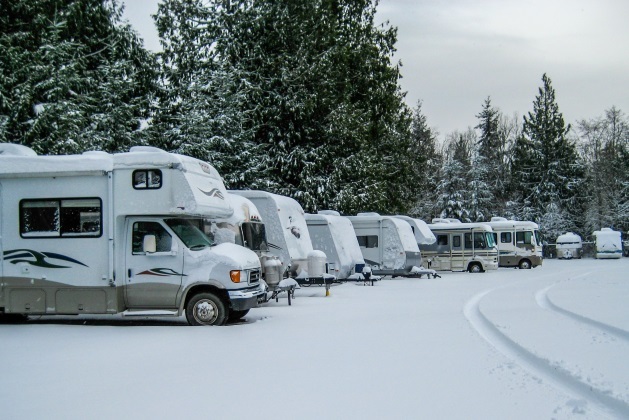 But sometimes you get caught in cold weather, and most RVs are not designed for cold. If you are RVing on the cold days, there are things you can do to reduce heat loss plus items you should have ready just in case. Note that I’m not addressing additional items that are needed if you are staying long-term in the cold (like heat tape). Most RVs have furnaces, but cranking up the heat is expensive and a waste if you are losing too much heat at the same time. Look for ways to reduce the heat loss. Of course, you can pull out the sweaters and sweatshirts during the cold so you don’t have to keep the furnace temperature setting high. Windows are a major heat loss in RVs. The first thing is to lock your windows. That extra latch helps close the seals in the window. Close the blinds when you don’t need them open for the view. 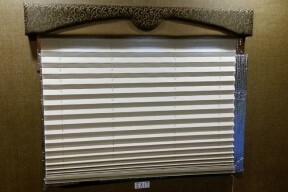 If you have curtains or secondary blackout blinds, use them. We use reflective roll insulation to make customized window covers (available from stores like Walmart, Lowe’s, or Home Depot). We stick them in the window then use the blinds, too. We also use them on hot days to reflect heat or at night just to keep light out. Vent cushions are designed to fit in standard vents to reduce heat loss or to keep air conditioning inside. We use these when we can. In one RV, our couch pillows actually fit well. 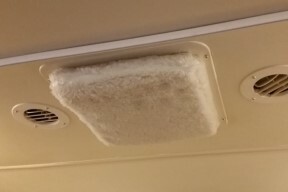 We added a fan to one vent and the cushion wouldn’t fit so we added Velcro to the ceiling and used reflective insulation to reduce heat loss. We found that some of our cabinets were getting too hot in the summer. We ended up adding this same thin insulation to the ceiling and wall inside the cabinets with double-sided tape. We assume this helps in cold weather, too. If you really need to reduce heat loss overnight, bring in your slides. This reduces heat loss from the seals and reduces the exposed surface area. It also reduces the volume of the air inside your RV that needs to be heated. We only do this when we are dry camping and are trying to reduce energy usage to a minimum. Of course you need to have spare blankets ready for your bed. We have also hung a light blanket to add an extra layer over the door and the seal around the door. We used clothespins to keep it in place. This especially helps if you need to go in and out the door as a temporary vestibule. More blankets or towels can used to block any cold drafts. If you are low on fresh water, fill your tank and use internal water instead of using your connection. Disconnect the outside supply water hose and store it somewhere a bit warmer. Remember to turn on the tank heaters in your RV. We try to do a dump during the warmer afternoon since everything is more difficult to work with in a cold morning. Depending on how cold it is, watch out for your sewer hose. We ended up cracking our “flexible” hose when we tried using it after a cold night. You can also buy a small electric space heater that you only bring out in cold weather. Some RV parks forbid these or will charge you extra. My theory is to buy a small one to just break the chill. Perhaps only use it in the morning. Follow all safety rules for these and make sure it has a tip-over safety switch.